Let’s talk ornamental grasses. You might be wondering what the heck an ornamental grass is… so let’s start there. These are the grasses you see intentionally placed in landscapes that are upright (can be up to 10′ high), clumped and generally form colored seed heads in autumn and in to winter. Ah yes, these are the beauties that add form, texture, foliage color and winter interest to any garden. There are many different types of grasses and surely one (or more!) to augment your current landscape. Few plants are so easy to cultivate and have the ability to catch the late afternoon sunlight as they gracefully dance in the wind. Like evergreen conifers they add late fall and winter interest to a landscape. Once they bloom in the late summer, the seed heads are kept until spring adding to the garden when most other plants have gone dormant. Ornamental grasses are at their best when combined with perennials or other grasses with contrasting colors or textures. When I use grasses in my designs, the first thing I think about is color. For example, Blue Avena Grass ( Helictotrichon sempervirens ) (3’X 2′) has a powder blue leaf color. This grass mixes beautifully with blue flowering perennials such as Larkspur, Columbine or other blue foliaged plants such as Lamb’s ears or Snow-in-Summer. To contrast this blue color, use next to burgundy colored plants such as Red Leaf Barberries or Purple Leaf Plum for real punch. 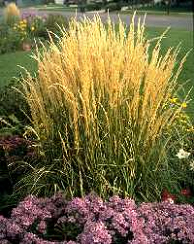 Karl Foerster Feather Reed Grass ( Calamagrostis acutiflora ) (4’X 2′) is another ornamental grass of great value. Instead of a fountain shape, it is more cylindrical and has deep green foliage with wheat colored seed heads. This grass can fit in very narrow spaces and adds wonderful color for backdrop. This grass mixes fabulously with Russian Sage and Black-eyed Susan. Sometimes grasses are best used as foundation plantings filling narrow spaces between windows or at the corners of the house. Very bold grasses such as Maiden Hair Grass ( Miscanthus sinensis ) (5′-6’X3′) can be used to anchor the ends of a bed or corners of a house. Most of these grasses need full sun to fully develop their seed heads and reach their full potential. However there are some grasses that do thrive in partial shade. Generally the variegated (leaves that are green and white) forms of grasses do well in shade. Grasses such as Variegated Miscanthus Grass ( Miscanthus sinensis ‘Variegata’) and Variegated Feather Reed Grass ( Calamagrostis acutiflora ‘Overdam’) can bring a shade garden alive with their fountain-like form and white and green foliage. And if size is what you are after, Plume Grass ( Saccharum ravennae ) is your answer. This grass shoots its silvery seed heads skyward reaching heights of 8 to 12′, easily taking the place of a smaller ornamental tree. Be sure to plant with other large grasses and perennials so that it doesn’t look out of place. Laura Robinson is an award-winning, Stapleton based, Landscape Designer and owner of Sundial Designs. She can be contacted at 303-868-8156 or www.sundialdesigns.com. Stumped on how to create the yard of your dreams?